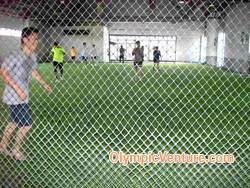 Installed 12mm Olymflex Sandwich Gym Floor for JKR in Johor (August 2009). 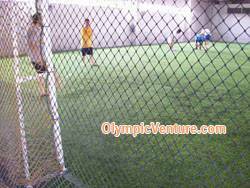 Installed 1 Olymplus Rubberized futsal court in Rawang, Selangor (August 2009). Installed 2 futsal courts using Synthetic Turf 22/170 in Gembira Parade, Penang (August 2009). 2 synthetic turf futsal courts in Gembira Parade, Penang. Another view of 2 synthetic turf futsal courts. 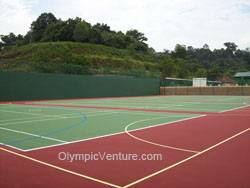 Used Plexipave for 2 tennis, 2 volleyball, 2 sepak takraw in Jawi Prison Project, Penang (August 2009). 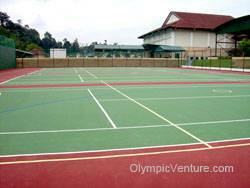 Re-surfaced multi-purpose court consisting of 4 tennis courts, netball courts, volleyball courts and hockey arena using Plexipave in Alice Smith Secondary School, Seri Kembangan, KL (September 2009). Another view of multi-purpose courts using Plexipave coating in Alice Smith Secondary School, Seri Kembangan, KL.